Bizarre Irish weather for June has resulted in an ice storm in Donegal and pounding rain and flooding throughout the country. The ice storm left several inches of ice near the village of Termon in Donegal the Irish Independent reported. Local photojournalist Frank McGettigan stated he had never seen anything like it "No one around here has ever seen anything like this in June before. It was really odd." A Met Eireann forecaster Joan Blackburn expalined the phenomenon "All rain starts as a frozen product," she said. "A downdraft would push the hail down quicker than it can melt, and this is not unheard of. Also, it's not particularly mild, and because the shower is so intense, the hail doesn't have time to melt and fall as rain." Forecasters warned there is no let up in sight for the Irish with heavy rain and flooding predicted nationwide making last week’s heat wave a fond memory.The weekend will be unsettled, with some dry spells. "It has been wet -- and it's going to be wet," Ms Blackburn said. However she said conditions will improve "Dry weather will start to make its way up the country, but it will be windy and wet for a lot of places. the last to dry out." Police are warning of tough driving conditions. "Please be aware of all others on the road and travel a safe distance from cars in front of you," a spokesman said. "Conditions can be changeable from area to area, so always drive at a speed suitable to conditions, and remain conscious that flooding may occur and visibility may be reduced." One of the worst hit areas was the Sant’Elena island where an open air market was in progress. The tornado caused terrified shoppers to dash for cover. A water bus ticket office had its roof ripped off by the tornado which some reports stated was a waterspout. A number of boats were capsized. 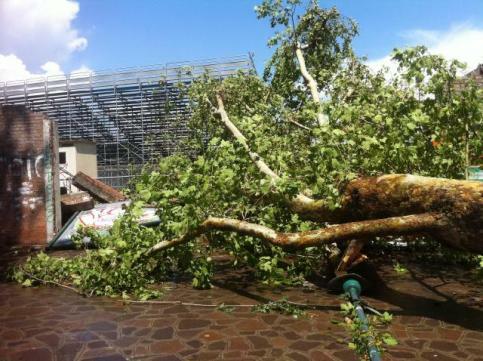 Around one hundred trees on Certosa Island were knocked down by the tornado and the outdoor dining area of the island’s restaurant was completely destroyed. On Sant’Erasmo island, the roofs were removed from around a dozen houses, according to reports from emergency services in the area. In the interests of safety, the cemetery on Sant’Erasmo island has been closed. Downpours hit Alto Lario, in the area of the Lake of Como. During the last few hours a mudslide fell towards a group of houses in Porlezza, (Como) and the Local Police immediately evacuated two buildings for precautionary reasons. Six people were evacuated. The mudslide hit the Cima hamlet and the two houses are in Via San Giorgio. One was only just brushed by the river of mud and debris, the other had the whole ground floor flooded. The family was sleeping on the first floor. 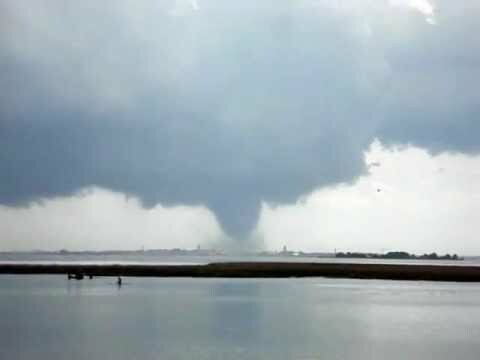 Un tornado arrasó una feria al aire libre en un pueblo de España, derribó una noria y dejó 35 heridos, mientras que el balance de muertos en las inundaciones en el sur del país ascendía a 10 personas. MADRID.- El tornado ocurrido este viernes por la noche causó destrucción en varios juegos del parque de diversiones y se cortó el servicio eléctrico en la feria levantada en la plaza principal del pueblo de Gandia, informó el municipio en su sitio de Internet. Dijo que el estado de 15 de los heridos era de gravedad. Los medios locales informaron que la feria estaba cerrada en el momento que se abatió la tormenta y que todos los heridos eran trabajadores de la feria. Tierra adentro de un pueblo costero del sur español, otras tres víctimas de una violenta inundación fueron halladas durante la noche. Entre las víctimas había una mujer del pueblo de Lorca. I don't see weather warnings for Europe...Anyway that is the remnant of former hurricane JOAQUIN near Europe. Image captured about 0800 UTC today, NHC Northwest Atlantic flash. Yowbarb Note: I don't know if Tropical Storm KATE will affect the European coastline. Yowbarb Note: Tens of thousands of people in the UK were without power during Storm Katie. Yowbarb Note: This is a guess on my part. Tropical Storm NICOLE may eventually impact the UK, EU. Or, tropical system or remnant Nicole might weaken so much by its arrival, not much affect.